Mr. Nolde's Third Grade Page!! Before trying any of these experiments, you must have "Shockwave" and "Flash" on your computer. Click on any of the subject areas to quickly get to that section of the 3rd Grade Page. How much do I weigh on the Moon? -Go to the weighing station to find out! As you learned in class, gravity is the force that pulls things towards the center of the Earth. When we weigh something, we are actually measuring this force! Your bodyweight will be different, depending on what planet you're standing on! Estimating Mass -In class, we did an activity in which we estimated the mass of various objects and then determined their actual mass using a balance and place value blocks. This activity gives you plenty of practice with estimating mass in Grams and Kilograms. Changing States of Matter -Find out what happens when you continue to apply more and more heat to a solid block of ice. Continue to click on the "Heat" button in this activity! You just might be surprised with what eventually happens!! Solids & Liquids -When we learned about physical changes in class, we learned that all solid matter can change into a liquid if you give it enough energy in the form of heat. In this activity, test various kinds of matter by heating and cooling them. Find out which materials have a higher melting point and which materials cool quickly. Characteristics of Materials -This activity lets you experiment on a wide variety of different materials. When you are finished, you will discover which materials are flexible (Can they bend? ), which materials are transparent (Can you see clearly through it? ), which materials are waterproof, and which materials are strong. Reversible & Irreversible Changes -When we explored the differences between chemical and physical changes in class, we discovered that physical changes could easily be "reversed" or changed back to their original form. In this activity, you will perform various tasks of dissolving, heating, and filtering to discover which materials undergo reversible & which materials undergo irreversible changes. Changing States - As we learned in class, when ice melts it's a physical change because whether it is a solid or a liquid, it's STILL water! See if you have the survival skills in this activity to turn frozen ice in the the cold environment of Alaska to drinkable water. Once you have finished all parts of the adventure, be sure to play the quiz! Melting & Boiling - As we learned in class, when ice melts it's a physical change because whether it is a solid or a liquid, it's STILL water! We also learned that ice melts when it is placed in a warm enough environment, but did you know that all matter can melt and turn into a liquid? Many materials melt at much higher temperatures than water does. In this activity, test three different mystery materials and discover their melting point & boiling point. Chemical and Physical Changes Lab -See if you can correctly identify which changes are chemical changes and which changes are physical changes. Chemical & Physical Changes Quiz - In class, we discovered what the differences were between a chemical change and a physical change. See if you can correctly identify which changes are chemical changes and which changes are physical changes in this quiz. See if you can get a perfect score of 20! Click the "Start Now" button to begin your adventure! Ship Floating Experiment - Did you know that a ship will float in water at different levels depending on how warm or cold the water is? Did you also know that a ship will float at different levels depending on how much salt there is in the water? Click on this activity to learn more about how temperature and salt content affects the density of water. Floating & Sinking - What would happen if we dropped a ball into a jar of honey? How long do you think it would take for the ball to sink to the bottom of the jar? What if we dropped that same ball into different kinds of liquids? Would the ball sink to the bottom at the same speed? In this activity you get to experiment with 4 different kinds of liquids doing just that! Once you have collected your data, create a bar graph using that data. Exploring Density - This activity allows you to compare how different items float or sink in different liquids. Be sure to use the drop-down menu to change liquids. Just click and drag the different items into the liquid container. Based on your experimentation, which liquid is the MOST dense in this activity?? Be sure to click "Launch Gizmo" to begin your adventure! Separating Mixtures Lab -In class, we learned that mixtures are combinations of two or more different substances put together that can easily be separated. But did you realize that there are many different ways of separating mixtures? Play this activity to learn more. Mixtures & Solutions -In this activity, you dig around and find things in a junk yard. Add them to your bucket of water to see if they form a mixture or a solution. Measuring Mass -Find out which material has the most mass- Air, Water, Oil, or Helium. Place each item on the scale like we did in class. Forces & Movement -In this activity, drag the red handle back to the yellow light to give the truck a little push. Find out how far the truck travels. Be sure to test the larger truck as well. Does it go as far? Why or why not? Forces in Action -In this activity, see how far the truck travels when you increase or decrease the slope. You can also see how placing different sized parachutes and different sized weights on the back of the truck affects the motion of the truck as well. Forces Interactive -This website allows you to explore virtually everything you'd ever want to know about forces! Click on the RED box or the "mind map" on the bottom of the screen to begin your adventure. Forces & Motion -This website does a great job of exploring the concepts of net force, motion, friction, and acceleration. Exploring Friction -In this activity, see how far the sleigh travels on different surfaces using either a small push force or a large push force. Which surface did the sleigh travel the furthest? Why do you think so? Which surface did the sleigh travel the smallest distance? Why do you think so? The Energy Resource Game -Which energy resources are non-renewable? Which energy sources are inexhaustible? Play the energy resource game to find out! First, identify the resources, then click and drag the item to one of the 3 black holes. If you identify the resource correctly, it will disappear! Strange Matter- The Transformer! -In this activity, you get to transform or change matter into different things by heating them, beating them, or by chemically treating them. Find out what happens when we take the raw materials of silicon, iron, and carbon and put them through the transformer! Strange Matter-The Crusher! -Which materials are the strongest? In this activity, you get to crush all sorts of different types of materials. Click on different contests and find out who the winners are! Remember: The strongest material crushes last! Strange Matter-Zoom! -Discover the incredibly small world where materials scientists do their work by zooming inside a soda can. Click on the red arrow to begin your adventure! The Great Balloon Race -Why do hot air balloons rise? It all has to do with density!! The more packed together something is, the more dense it is. As we have discovered in science lab, when matter is less dense, it tends to float. When matter is more dense it tends to sink. But how does this work with a hot air balloon? Well, when the air inside a balloon is heated, the air molecules move around faster and spread out, becoming less dense. That's why a hot air balloon rises! To lower the hot air balloon once again, we allow the air in the balloon to cool down. See how good your air balloon flying skills are in this activity. See if you can beat my personal best score of 2:00 minutes for the "easy" race! Line Rider -See if you can carefully design a sledding track that will allow our sledder to make a successful run down the track. Be sure not to make your slope too steep! Have fun and good luck! Simple Machines Around the House -This is one of the best activities that I've ever seen on simple machines. Be sure to check out all four rooms in the house to learn about simple machines. Also, be sure to check out the tool shed to learn about compound machines. Edheads The Compound Machine -Just when you think it doesn't get any better than the first Edheads simple machine activity, they come out with another one that it even MORE creative! See if you can get a perfect score of 120 points in this activity. Build a Rube Goldberg Machine! -Who is Rube Goldberg? He was a cartoon writer who had a cartoon called "The Inventions of Professor Lucifer Gorgonzola Butts." In his cartoon, the professor would build these really crazy and complicated machines that would do simple tasks. Using levers, pulleys, and ramps build your own Rube Goldberg machine. See if you can adjust these simple machines to lift the dog to catch the burglar. Simple Machines in a Lawnmower -It always amazes me just how many simple machines are around us at all times. See if you can find all SIX simple machines in this lawnmower! Move the Moai Statues of Easter Island -Do you remember trying to solve the mysteries of Stonehenge in class? Well, this is a different mystery. About 3,000 years ago the people of Easter Island, a tiny little island in the Pacific, moved and built these really cool 14 ton statues called Moai Statues. This activity lets you be the boss of Easter Island. You direct the people so that they can be successful in moving these statues. Mysteries of the Nile -In class, we learned how the ancient druids moved the stones of Stonehenge using simple machines. We also learned how they were able to move them upright as well using levers. The ancient Egyptians up righted their obelisks using similar methods. Click here to learn more. The Adventures of Twitch the Robot -This really fun activity comes from the Museum of Science & Industry in Chicago. See if you can help Twitch get the spare parts that he needs to help rebuild his robot! The Virtual Rock Laboratory!-What kind of rock floats in water? Which rocks split easily? What kinds of rocks are more resistant to wearing away? Find out the answers to these questions & more by testing various rocks in your own virtual laboratory! Name That Rock! -This activity is one that I built and designed myself. Play this game to learn about some of the most common rocks in the world. The 15 Most Wanted Quiz Game! -This activity is one that I designed for my sixth graders. It will also help you learn to identify some of the most common rocks found throughout the world. Minerals and Metals Around the House -Did you ever stop and think about just how many raw materials are used in all of the things that we have in our house? This game helps you discover just some of the many minerals and metals that are used in making the many things that we take for granted. Mohs' Drill & Castle of Doom! -Learn about Mohs Mineral Hardness Scale while escaping the Castle of Doom! The walls are closing in on you. To escape, you must drill through the walls. See if you can find the right drill to blast through the wall. Igneous Rock Crystallization Animations -Click on the labeled features to learn about how igneous rocks form under different cooling conditions. Cementation of Sedimentary Rocks -This animation gives you a better understanding as to how sedimentary rocks like sandstone form over time. Rock Cycle Interactive -Begin your adventure by collecting and learning about various rocks. All of the rocks that you collect are ones that we are learning about and will be on our lab practical! Also, be sure to click on the Rock Cycle Diagram. There are a lot of good animations to click on to help you better understand all of the processes that happen in the rock cycle. Interactive Animated Rock Cycle -This animation does an excellent job helping you to understand all of the different parts of the rock cycle. Click the image to start the animation. Each time the main animation stops, be sure to click on the blinking features to see a visualization. Drag & Drop Rock Cycle Chart -This activity will help you review all of the basic processes that happen throughout the course of the rock cycle. See if you can correctly place each label into this rock cycle chart. Another Animated Rock Cycle -Although I like our rock cycle chart better than the one in this activity, there are some cool looking animations that are worth clicking on! Take the Rock ID. Challenge -There are pictures of 12 different rocks. Test each rock by doing a number of on-line experiments. Be sure to use the "Rock Key" to help you in figuring out what each rock is. Good luck! Find a Rock -Use the Foss database to find out about all sorts of rocks and minerals. A lot of the rocks and minerals found here, are ones that we've already discovered and learned about in class. I think that you'll be surprised at what you will remember from class! Layers of the Earth -This site does a great job of quickly explaining the three basic layers of the Earth. Shape it Up! -In science lab, we explored how the Grand Canyon was formed by the powerful eroding force of water. This activity explores how wind, water, volcanoes, and glaciers have an impact on the shape of our land over time. Be sure to play this game more than once! Although you might get the same landform with the same erosional force, it might be showing you a different length of time! The Virtual Stream Table Lab -Did you enjoy the work that we did with stream tables? There are so many really cool experiments that can be done with stream tables. This activity allows you to compare 2 stream tables at the same time by changing one variable in the experiment. The variables (the thing you change in an experiment!) include the length of time, the slope, the stream flow rate, and type of material. I recommend that you click on the "View Stream Table" first! Then click on the RED "?" in the upper right corner of the screen. It will explain all of the variables as well as how to conduct the different experiments. Landforms Created by Erosion -Click on different parts of the U.S. map to see the different types of landforms that have all been created by forces of erosion. The Water Cycle Explained -Click on the various parts of this interactive to learn more about all of the processes that are involved in the water cycle. What Happens During the Water Cycle? -Here is another great resource about the water cycle. Click on the arrows in this interactive to learn more about all of the processes that are involved in the water cycle. Water Cycle Diagram -Click on the various parts of this interactive diagram to learn more about all of the processes that are involved in the water cycle. Water Cycle Interactive Video -Click on the various parts of this interactive video to learn more about all of the processes that are involved in the water cycle. Water Cycle Game -This activity is a great way to learn about and remember all of the important parts of the water cycle. Exploring Life Cyles -Click on the animals to play the different life cycle games. Be sure to play the movie to get an overview about the life cycles of animals. Living Things in Their Environment -Why don't polar bears slip on the ice when it runs? In part 2 of this activity, drag and drop the feet of various animals to the environment to which those feet are best suited. The Secrets of Survival Challenge -Penguins live in rugged terrain and face some of the harshest weather on the planet. In this activity, discover how these birds have adapted themselves to such a harsh environment! Worlds Within the Sea -See if you can follow the clues until you have connected all of the creatures in each of the three ocean ecosystems: The Deep Sea, The Coral Reef, and The Continental Shelf. Habitats of the Rainforest -This game is similar to the one above, except that it explores three different ecosystems found in the rainforests of the Central African Republic: The Forest, The Bai, and The River. Click on each of the three boxes to begin your adventure. Life in the City -You might not think that the city would be a habitat that would support a great diversity of life. This activity takes you to a city park and gives you a closer look at the surprising world around us! Fun with Food Webs -See if you can put all of the plants and animals in the correct spots for three different types of food webs- meadow, arctic, & pond habitats. Build a Fish -See if you can design a fish with the right adaptations to survive. Try different combinations and see which ones work together. 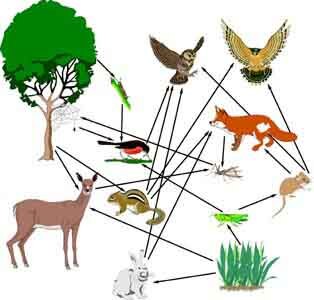 Food Chain Reaction -A lot of people don't realize just how much the survival of each plant and animal affects the balance of a food web. Play this game to learn more. Recycle City -Click on different parts of the map to learn more about Recycle City. Then play the Dumptown Game to learn more about the ways in which we can recycle, reduce, & reuse waste. The Great Habitat Match-Up -The place in which animals live is called their habitat. See if you can match all of the animals with their habitats. Habitats & Food Chains -This activity features a woodland and a pond habitat. Take pictures of 8 different organisms that live in these habitats. Be sure to click on the magnifying lens to learn more about each organism. Also, see if you can correctly create 2 different food chains using organisms from these two different habitats.